All dating advice, whether sincere or Machiavellian in its ruthlessness, is rooted in the same hodgepodge of soft sciences. The pickup artist/seduction community prides itself on applying “scientific rigor” to its tail-getting methods because it draws on a host of books about gender and power. Robert Greene’s famous bible of come-ons, The Art of Seduction, uses real historical examples of political and psychological power plays from Freud to Einstein to Cleopatra to Warhol to win over hearts and minds. 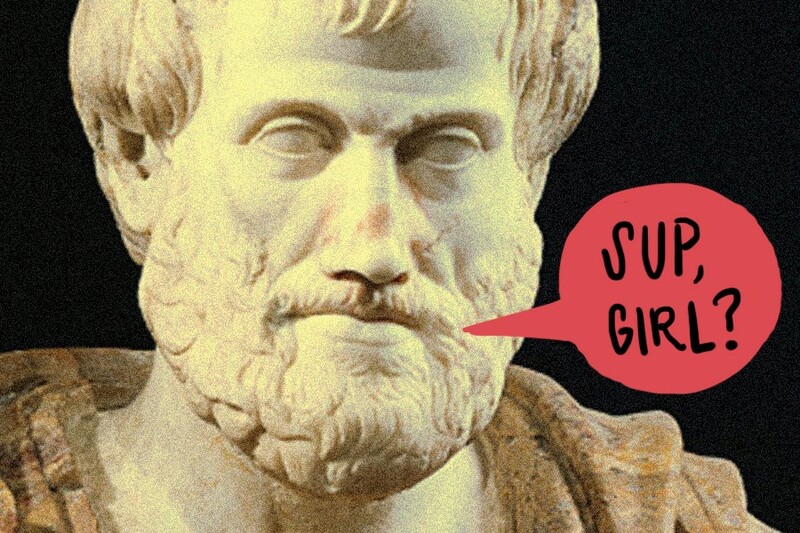 His professor advised him in the ancient art of rhetoric as laid out by Aristotle, whose three modes — called ethos, logos and pathos — are meant as a kind of slam-dunk of persuasion that, if done correctly, appeals to the speaker’s credibility, the logical mind’s need for supporting facts, and the audience’s emotions. In other words, you should hit three major notes in an effort to talk someone into something: Identify yourself as a person of character, drop some facts to seal the deal, and play to your crowd emotionally. Saying he “hates to come on too strong here” shows he’s not, in fact, some kind of crazy stalker (ethos). Jake appeals to Hannah’s factual need for chill and sustenance when he says he is offering her a stress-free night after work or some food to assist in her move into a new apartment (logos). And pitching the dinner as a “fun and great way” to see her and her dog further underscore that this will be a good time for everyone involved (pathos). It worked. Hannah responds, “That would be great,” and rather than let the text request for a date hang in brutal texting purgatory as so many would, she even pitches a time and place (Friday night after she gets off work, at 6 p.m.). She offers to bring Winston the dog, too. While his post-date enthusiasm is a bit over the top, this is the stuff of sitcoms and rom-coms, and it’s refreshing that he really liked Hannah in a sincere way, and wanted to hang out with her. What’s more, it wasn’t some gross move: insulting her (negging) or otherwise using smoke and mirrors. So much of dating advice for men today implies that women must be tricked into going on dates. Here is a guy who simply liked a gal and told her in a charming way. They hung out; they hit it off. Isn’t that really what we all want in a date? Isn’t understanding that key to dating advice? But if the act is simply sprucing up the real goods, it’s hard to argue with. This is why other dating advice we’ve highlighted at MEL is similar in its honest, yet charming humility, advising people on dates to show that they’re strong but also vulnerable; basically, be self-aware but with a sense of humor that conveys you aren’t a total neurotic weirdo. Yes, we are all total neurotic weirdos in some way or another. But dating is ultimately the exercise of knowing how to mete out this rough-around-the-edges person until someone likes you enough to take you straight-up, no chaser. Of course, ethos-logos-pathos might not work for everyone. It’s not going to make someone who despises you suddenly find you irresistible. But it will make someone who is on the fence or who already finds you a little bit interesting see you as a sanely charming person that they have nothing to lose by spending an evening with. The rest, as they say, is ancient philosophical history.